J. P. Moore’s This Strange Town – Liberal Missouri, A History of the Early Years, 1880 to 1910 has no index. Thinking at least a name index might be helpful, I have prepared one. George H. Walser is mentioned on virtually every page of the book so I’ve not counted him in the index. Rather than having an “end of book” index, I’ve indexed names by chapter, so some will be repeated several times. This is a terrific resource. I’m doing some research on John & Mary Mcrae who appear in the above index on pg 86 under THE SPIRITUAL, SCIENCE ASSOCIATION AND THE OLD SPOOK HALL section. How can I access this particular section? John, Mary and their family moved to Liberal from Nova Scotia about 1882. John had operated a grist mill (long since gone) literally a stone’s throw from where I grew up. Thanks in advance for your assistance. Walter, thanks. I’ll transcribe the chapter for you today and get it up. Will let you know when I’m done. Walter, I’ve transcribed and put the chapter up here. Thanks a lot – quick turn around! You’re welcome. Best way for me to not procrastinate is to see to something promptly and I had the time at the moment. Jason, I’ve placed the transcription for you here. James Proctor Moore was my step great grandfather. I am interested in getting a copy of his book, but am having troubles finding a copy to purchase. Do you know of any place I can find one? Hi Michelle! Is your mother Marie? I am JP’s great-granddaughter, Gloria. Never knew you responded, sorry for the delayed response. My email is michelyna93@yahoo.com . I’d love to hear from you! I don’t know. I purchased my copy about 12 years ago and it only reads that it was reprinted 1999 by a “Liberal Area Civic Group”. 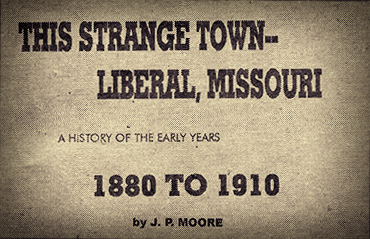 You could check with the Barton County Historical Society and see if they know. If they don’t, I’ve been slowly getting chapters up here and could reinvigorate myself and could put a push on it and get them up over the next month. Let me know.